I am pretty positive LE is or was of the strong opinion that Logan Storm was involved. The weight of that statement multiplies coming from you Ms. B…is that new info?…While this feeble old memory does recall his name bounced through here on several occasions….but I don’t recall you having such a firm opinion. I am a firm believer in multiple sources- most especially when discussing this subject matter. I don’t know how or why it was initiated as it relates to Kyron’s case, but the possibility of Storm being involved somehow was definitely the focus of MCSO efforts and they directly confirmed it was Storm in the Christmas 2008 pic taken by Terry. This confirmation follows his initial arrest so I can’t say if it was fodder before that. Maybe it had to do with ADA Rees’s “wiff” at him twice around? (*wiff used as a term for never connecting bat with ball). The evidence does not point to her! But we have professional, albeit inexperienced investigators using her as a defacto suspect. To what end? Cover up of the botched investigation? Protecting Kaine and other LE in connection to the roids? Protecting someone with regard to the possible abuse? Punishment for TH? A combo of all the above? LE never announced DDS was no longer in their cross-hairs, so to that end, that tells me they could care less who they make *uncomfortable*, or whose life they ruin while they proceed in this investigation. So, if TMH dropped off their radar as well, I doubt any of us, including she would be informed. If TMH, gave LE the same information re: possible molestation to LE, and they brushed it aside as being what DY called Terri making things up, or whatever, or worse totally ignored it, shame on them. Perhaps this theory has been slightly explored and IS just one of LE’s theories. Perhaps this is the main reason they have not arrested TMH, because the possibility exists that he was being abused, and TMH, apparently, is the only one who cared enough to do anything about it. IDK, but it’s possible that LE has Terri on the back burner, and is simply waiting for someone else to make a mistake. 5 1/2 years is along time to wait, but we’ve seen cases where LE waited way longer. IMHO, they will never announce anyone is cleared, until they make an arrest. The one thing I don’t understand re: LE, is why they won’t request an interview with TMH AND her attorney, especially if this information TMH has given us is true. In DY’s recent interviews, she talked again about “one year prior” being when she started seeing changes in Kyron. Yet she did nothing. Did TMH see those too? Or did TMH only see these changes weeks before Kyron went missing as she indicated in her emails? These two mom’s need their notes compared, and if LE hasn’t done that, and isolated TMH as the suspect before that was done, then IMHO they’ve blown an opportunity to get to the truth. And since that’s what Terri says she wants, we should see LE publicly reaching out to TMH and her attorney for interviews. If we don’t see that, then wth is going on? As you know, there is no Universe where it makes sense to continue to investigate a person, complete with SEVERAL YEARS of warrants (you saw a poster post that she was interviewed as a result of meeting TH years after Kyron’s disappearance with Herron waving his Sauvie cell ping around (seriously- wtf trains and oversees these people?) without requesting interviews. What changed after 3 weeks of frequent and constant contact, to include an assigned FBI agent if she ever left the house that just because she hired a lawyer (about 3 weeks late if you ask me) LE interviews of a primary suspect became, well, unnecessary, to furtherance of the investigation of a missing 7 yo? Reminder here- NAMED BY NORM FRINK himself- DDS gave plenty of interviews with counsel and so apparently it is not a cultural idiocy in general. Wow. Logan Storm. That just blew me away. WHAT? Wow. We are getting a lot of good info this week. You’ve been holding out on us, Blink. 1. Not everyone in a LE capacity that worked on this case believes TH is guilty, worthy of suspect status, or that MCSO isn’t evading an eventual audit of this case. 2. I have no idea if Storm was involved, I am not rendering my personal or professional opinion on that- Just what I said. Yes, it is a shame someone got killed. My hubby said the same things weeks ago, turn off the power, block the roads. I hope they serve time. I’m not against some of their principles, the BLM owns waaaaay too much property around here, however, that’s not the way to go about changing things. Then after this is done Take a look at Kaine And just what he is hiding Because why didn’t he and DY go after that school And demand. Just what I suggested. Malty I have a colleague who like you, is adamant the school and surrounding grounds are worthy of better scrutiny. So, Tiny, who do you think should disseminate the information Kyron left Ms. Mathews’ room with a male and Terri could not have been involved that day, and how do you think that responsible party should disseminate it to parents in Skyline school and in the surrounding neighborhood for public safety purposes? Should a sketch have been provided? I suppose the candidates are Carol Smith to the School Board in public session, the employee in the DA’s office (Rees?) currently in change, or Sheriff Staton or his delegate? Obviously a public community meeting will not be sponsored at Brooks Hill Church by its owner. Skyline is classified as Historic so they must adhere to any remod conditions or repairs. That said, it would not preclude someone who knew the blueprints or plans at some point. You would be a great candidate I agree. O/T: LOL Agreed! ( major Romney lover up in here) If you have not seen the SNL spoof of Trump and Tina Fey (as Palin) it is a gut splitter. @first-time. an argument mcso knows who SZ is and he worked in some capacity in the school bldg. They do not have enough to try him to Beyong a Reas Doubt, or they’d rather convict her than him, as the latter would leave PPS sharing culpability. Maybe they think TH knew him from her volunteer work and used him as they said she did Rudy & Mike. I know that I have said this here before – probably multiple times: I am hung up on the identity of SZ and how/why he hasn’t been id’d or spoken about. If any witnesses that day knew him, he obvi had an alibi, right? And I think somehow his name would have leaked. If he’s was unknown to all who saw him, then the lack of a name makes sense. IF it was Storm, surely others at Skyline could have id’d him. So if Storm’s involved, he had an accomplice or a disguise. I think I’ll go back to posts related to the mayor’s tweet re the unknown male in the pic. maybe there is more to be understood there. ….and round and round we go again. Def not Storm but to your point- a FLAT AND FAT NO that persons identity is confirmed by LE. Sam Adams tweeted it and O’Donell asked all parents about him. Do you know what they are doing today in regards to the investigation? More interviews? Have they searched the school again? More lie detector tests? Nope. According to my colleagues in the media as well- not even the PIO is returning any requests for comment on the case. One wonders why Desiree doesn’t sic her cadaver dog crew on the school physical plant, not Kaine’s home, as the former is the crime scene. Someone familiar with the school could’ve returned him after the school search was over. I myself always like the steam commercial boiler as a disposal tool. Delightful if Marshall in private practice took Terri’s Federal suit on. The explanation she is not being interviewed with Counsel is they know the interviews will all be exculpatory imo. What idiot Judge was giving Herron warrants on people Terri met well after the abduction? I do not know but 4 corners can apply to more than a warrant- and if FBI dirtboxes are in play- best of luck cleaning up all that dirt. I also believe any interview would reveal improper technique whether past or present. “Coloroable” is all over this. that guy looked homeless or maybe from Clackistan. Gosh darnit – I didn’t properly copy the link to a post from 2011, and I can’t find it again! Blink – I think I read in said earlier posts that the Mystery Man in the photos referenced in the mayor’s tweet WAS id’d and he was cleared per MCSO. Am I interpreting your latest comment correctly – that is that the MM’s id has NOT been confirmed? Sorry to beat this possibly-dead horse. The only place I have ever seen that claimed that individual was identified and/or cleared by MCSO ( and I am not sure I agree on the verbiage) was some woman’s FB post. If that is true, it would make at least a few years of investigative work I am aware of to identify him a waste. My info says this was a major component of the initial task force. That must be why mcso/da is so mad Terri wouldn’t just tell them Who MM Is! niw that his Dept has the Bundys’ prosecution. It gives me a shred of hope knowing that there were other avenues of investigation. Maybe LE is still looking for sz. Hello dear friends and FriendLY. I wish I had something meaningful to offer to this thread. As always, I’m awe struck by the knowledge, determination and loyalty y’all have for the lives of the lost and misunderstood. All the side stepping and finger pointing in Kyron’s case has been of negative value…and probably prevented a solvable case. Not trying to be Capt. Obvious. Im praying that the All Knowing will bring into the light which looms in the dark. At the very least, I’m so grateful this lil man is never lost to His Heavenly Father. ..and thank you soooooo much for the love and support. I’m humbled and counting my BOC blessings!!! Each of you have a special place in this hoser’s heart. I’m so proud of FriendLY’s yuuuuuge advances in her career and advocacy. It’s been a pure privilege to watch the growth of BOC and Blinksters, alike. I’m also so sorry for y’all and what you’ve endured throughout the primaries. Here, we just cut to the chase and go straight to the kiss and cry (figure skating term). This is where the non voting citzens hang to see who the 65% voter turnout, elected. We’ve been crying ever since. Seriously, exercise your right to vote! All things considered, I’m grateful we have a God who’s bigger than any political or judicial ego. Tried, tested and true. One thing that has always bothered me was before Kyron went missing, there were problems in the school with Kyron listening to the adults. And Kyrons parents working with him on this issue. Just seems to be quite a coincidence with this and him being abducted from school. Might not be a coincidence at all, but closely odd timing don’t you think? Children do tend to act differently when they are being abused mentally, physically or sexually. 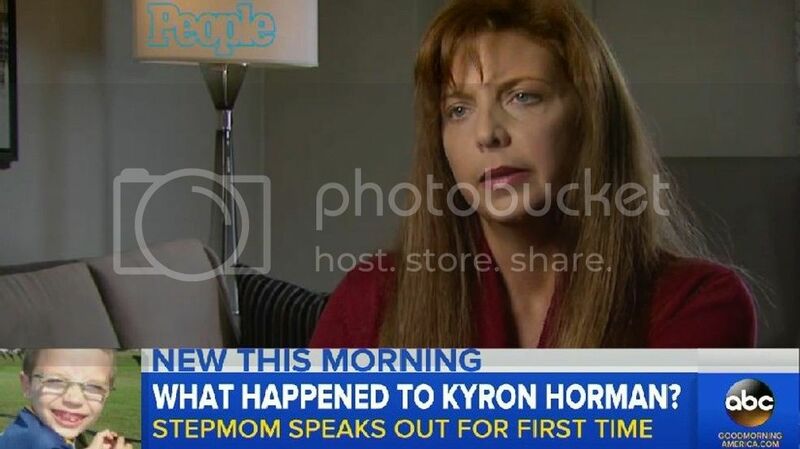 So I really do believe Terri when she says she suspected Kyron was being molested. I believe she was concerned as to the possibility and was having him evaluated as a result. I believe once the Federal DOJ criminal division had Storm not only in their sights but were tasked with his prosecution, if a whiff of any stone could be turned to link Storm to the Horman abduction, Marshall would have lifted that stone and brought all her investigatory resources to bear on him. Whatever her litigation experience gaps (and her prowess was on this area) and her personal failings, she was a passionate prosecutor wrt crimes against children and imo if there was anything to go on, all DOJ OR resources woukd’ve been brought to bear. A conspiracy theorist could argue Marshall was deposed in part for wanting to take the ilk of Storm further down the road. I relooked at Turning Tide once, never again. or Tenditious but not Truths. reminds me of that Trashys LAMO style speak. come out of this smelling the opposite of roses. @TRuth, I think the article is gone and only the blog remains. This case has resonated with me and I’ve been following it since the beginning. In the beginning I drank the koolaid but after a few months things didn’t add up and what I read seemed more like propaganda then truth. So I post in other sites to try to divert the koolaid drinkers but I’m very frustrated that the emphasis has not been on Kyron but on demonizing Terry. My heart is heavy for Kyron and Terry and longing for justice for both of them. What is keeping Terry from pursuing legal action. Kaine’s actions and behavior are very suspicious as well as LE. With all of the statements from the bios essentially saying she did something with no proof does she not have any legal recourse. I would think some lawyer with an eye on potential books etc would take her case pro bono after all now we have “The Making of a Murderer” as a prototype. It needs to be stated over and over again that Terry was Kyron’s mother. The one that puts a child to bed, makes sure the child is fed and helps with homework and is there on a daily basis is the Mom. And as the Mom I can only imagine what Terry must be feeling. And there doesn’t seem to be any curiousity as to why TY gave Kyron up? Is she asked that question? I guess as a Mom myself I am very frustrated the direction this case has taken and wish Terry the very best. regina- I have received over a dozen posts similar to yours, marked private, by new posters to BOC. I just wanted to say thank you for feeling comfortable to post your thoughts. I am not an attorney although I do work in litigation support to include tort cases- it is my opinion TH has begun to speak out as a precursor to a civil action. One of the major distinctions between MAM and Terri’s allegations of LE/DA impropriety is that Avery was arrested. I’m on pins and needles waiting for Blink’s interview with TH. Long week for everyone and bi coastal. I am discussing Kyron’s case with Dana Pretzer tomorrow evening along with Making A Murderer, will post link. I will announce my interview with Terri Horman when we have a publish date. I am hopeful for an unedited piece. The tone has definitely changed. I noticed something off about a year ago. I even sent a ‘cease and desist’ letter demanding they stop using my name after I discovered PM’s that the owner had written to others spreading false rumors about my family. The page went into semi-hibernation until recently. Unfortunately a former ‘nobuddie’ was running that page… and ‘who-knows’ is now helping with the grammar. tkg- I am unclear- who are you saying was running that page? Ok to mark private. Lets try and answer a few questions posed by our Blink crew regarding myself. I don’t think I look like George W. Bush nor like Herbert Walker Bush although the H.W. comparison would be closer since his frame is more like mine and the jaw line is similar. I did have the chance to see H.W. in the Southwest Airline terminal at Hobby field during the 1980 Presidential campaign. I am older than W.,but younger than H.W. Mabe this post will get through. Firefox did an update this morning and a previous post did not make it. In a response to Blink’s comment about who is training these people and checking on them: Someone who knows little about the subject. One cannot teach what they do not know. A quality teacher must be able to present a subject in many ways so that all in the class get it. In the late 1980′s I hosted a group of LE people from various agencies in my home that were in Houston to take the SWAT course at the Houston police academy. The instructor used one method to approach a subject. I would sit with the students at night and go over the material they were given. There was zero historical connection which left out the reason that a particular subject was important in the new skill set. None knew for example what the Stockholm Syndrome was or where the term originated. Because the young men were not avid readers, they totally missed the stories in the national news magazines. Their instructor failed to give them any direction of where to get other information. For real learning to take place one needs three sources concerning the subject at hand. PORTLAND, Ore. – The Multnomah County Sheriff’s office said it knows who the mysterious man is in the background of the picture of Kyron Horman standing in front of his Tree Frog display. His name will not be released and the Sheriff’s office will not say if he is a parent or teacher. Now why we never, ever heard that anywhere else is beyond me. I’m hoping, beyond hope, that Terri coming forward does exactly what she says she wants. Turn the focus to finding Kyron. I’m sooooo tired of the back and forth banter we hear from the Terri-did-it groups. I wish there were more sites like this one, where folks really put their thinking caps on and go beyond this BS. I wish more locals would join in. I wish PPS wasn’t hiding in some corner either. I can only hope. The key to Kyron’s disappearance lies in day 1, ground zero and what transpired there. There, not SI, not Fred Meyers, not anywhere, just there, Skyline. I firmly believe that. A child disappeared from a public school in broad daylight with an over abundance of people around and no one knows a damn thing. Right. without reading the underlying article, it came from DY. so Blink, are you doing this interview in stages like DDS? @ TKG. You say on the FB Titillating Tenditious Tidbits about Terri (my rename) two someones help out as posting Admins, one with content, & one editing grammar. Have you speculation on today’s new lists on WS FB? “1. A local claimed that a co-worker who uses your gym said that LE had been to the gym several times for interviews and that you were there for only 15 minutes on June 4, 2010, not the hour you claimed. 2. A local claimed that you worked for Providence Medical Group many for two months many years ago and that you were fired for inappropriate behavior with a male medical assistant. 3. A local claimed Kyron’s school friend said that Kyron told her a day or two before June 4th that you told Kyron you had a secret day planned, possibly going to the fair. 4. A local claimed that you took a picture of Kyron walking towards his classroom. 5. One of your internet supporters claimed that your parents were at your house on June 4th and left that day. 6. Someone claimed that you told people that your son James was the person seen in your truck while you were touring the science fair. 7. Locals have said that Kyron was seen at the school leaving with you on June 4th. 8. A local said that you insisted on taking Kyron by yourself to tour the science fair projects instead of letting him go with the groups. 9. It was said that a parent claimed you were seen physically and verbally abusing Kyron at school during the school year. 10. One of your supporters claimed that you told her that the landscaper accosted you on May 9, 2010 and you called 911. Nobody seems to be able to find the 911 call. 11. Many people noticed that it took you nearly a week to change your Facebook profile picture to Kyron, even though you were on Facebook responding to posts. You only had Kyron’s picture up for about two weeks before taking it down. 12. A local said that the school called you at noon on June 4th, but you didn’t answer. The local said that you were supposed to be at the gym, but your phone pinged on Sauvie Island because you were making other calls and sending texts. 13. A local said that four days before Kyron disappeared, she saw him at the craft store where she worked. He was alone, so she helped him pick things out. She said that you were a few doors down at a liquor store. 12. A local said that you were seen at the bottom of the stairs at Skyline school near the lost and found rack where the lost jackets and sweaters were kept. the way I see it, all this miscellaneous stuff comes from that tips4kyron email asking forbduplications of “tips” previously sent to mcso, the email solicitation Soldier has been plugging for Desiree. Anonymous “locals” are worth the toilet paper one sedks as a last tesort to blow a nise when one can’t find the kleenex box. One wonders how much further along mcso might be if Desiree weren’t trying to conduct a parallel investigation these last few years. So I ponder- why would anyone bother to pen such questions, which I can tell you pointedly they are not at all source based (a local- really), anonymously and expect Ms. Horman to respond at all? Its not like her answers are going to be taken seriously or believed in the first place because none of these ninnies apparently know zip about the criminal investigative process and it would not matter a lick if MCSO and the DA openly admitted their errors holding hands with TH on the front steps of the courthouse that a single one of them will believe it in the first place. As an example- there is no local that has been in that gym that does not know- THERE ARE CAMERAS. They are timestamped. There is a sign in for Kiara and a sign out. Horman worked out with at least 2 individuals that day that HAVE CONFIRMED her timing. This is not and was never in dispute- in fact, when she participated in all 3 re-enactments ( LE standard protocol people read up) they forward their handy timers exactly from the park spot she used that day the time she was in, out, and never disputed it. More on these reenactments in my interview. I’m sorry, but which one (^^) of them are willing to discuss their personal and private information completely irrelevant to this case. Everyone got many answers they said they wanted but in the face of the fact that this woman goes on National TV and openly accuses MCSO and the DA of misconduct, which I am positive at the very least is the opening salvo in the litigation of same- who else took that risk at the crater, exactly? If one paints themselves as seeking to locate Kyron, and that their efforts are on his behalf, somebody better to learn to ask themselves the question- “What If I am wrong?” And if I am even possibly wrong- how am I contributing to the stagnancy of his case? According to the latest news, the sheriff has identified the man in the photo. you know Blink, just driving around, or finding parking, post “blizzard” saps energy. wish you the best with the week’s workload. OT I was just out driving and heard the usual, NPR Canadian Carol Ott, as she attempted to interview a Malheur residential malefactor David Frye who was 75 cents short of a mental dollar. Besides saying they’re here to kill us, and they shot Lavoy on his knees (discredited by a witness amongst his group), when asked if he’d broken any laws, his reply was Yes, I don’t have Obamacare. TRuth the primary foci of these”patriots” is on way more than BLM and grazing. Good luck Oregon because imo these white militias gravitate to States with weak and sympathetic Sheriffs. .75 cents of a mental dollar!! Keeper!